I was up very early this morning. It was a little after 330 AM. I don't usually get up this early and have no clue what disturbed my rest. I got dressed to go out and have a smoke. While I smoked, I was trying to decide if I should go back to bed or stay up. It was really quiet, no traffic on the street, the sky clear with plenty of stars to gaze at, and then I heard the owls calling. As I listened, I was hearing calls from three different locations, so I'm assuming there were three birds roosted waiting for something to eat. I remember when I lived in this neighborhood before, they used to perch on the telephone pole outside my back door. There's plenty of food for them in this area away from the inner city, rabbits, mice, gophers, small cats and kittens. I've only seen them once or twice. 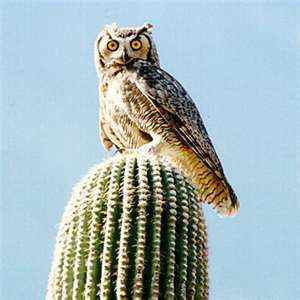 They're big, a desert variety of the Great Horned Owl, 18-27" tall with a wing span of 40-60". I've missed hearing them in the wee hours of the morning and I'm looking forward to hearing them again.